Support the Club - Sign up for an LAFC Debit Mastercard Today! Visit a branch near you to open your account today! 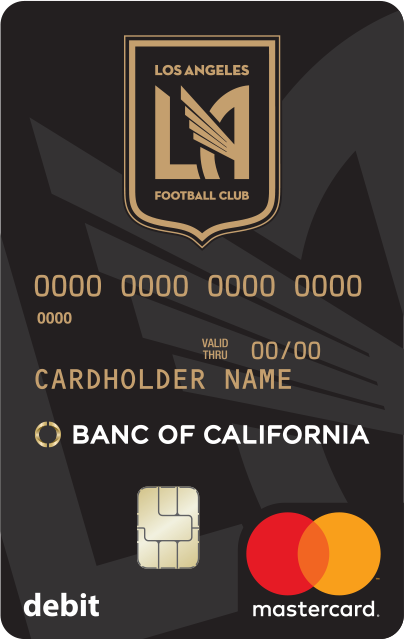 *LAFC branded debit card available while supplies last and is available for any Banc of California personal checking account. **LAFC hats only available to new Banc of California customers and limit one (1) hat per account holder. LAFC hat only available when you sign up for the LAFC debit card. New Banc of California customers must open checking account in a Banc of California branch. LAFC hats available while supplies last. ***Discount code only available when you sign up for the LAFC debit card and applies to LAFC merchandise purchased through the MLS Online Store. Discount code is offered through MLS and is subject to change at any time at MLS’s discretion. 1International fees may apply and other financial institutions or merchants may charge you for use of their ATMs or POS terminals. 2Must be enabled. Message and data rates may apply. Mastercard is a registered trademark and the circles design is a trademark of Mastercard International Incorporated, used pursuant to a license.